Swelling of the gums (or tumor) may occur for various reasons. To assign the proper treatment necessary to visit a dentist to get rid of painful sensations. The most common causes of inflammatory process of gums are swelling the neck of the tooth and swelling of the tooth root. In the first case, the pain is dull and constant, but not given in other parts of the head (ear, eyes, head). As a rule, the cause may be the aggravation of periodontitis or gingivitis. To get rid of possible complications (for example, pus from gums, increased tooth mobility) is necessary to eliminate the appearing plaque, Tartar using special drugs. Also an experienced expert will be appointed by application on the gums with the use of anti-inflammatory drugs. To restore the health of gums and teeth it is recommended to use medicated toothpastes. A tumor on the root of the tooth entails the emergence of pain in the ear or head. As a rule, the contact of the tooth with food increases the pain. 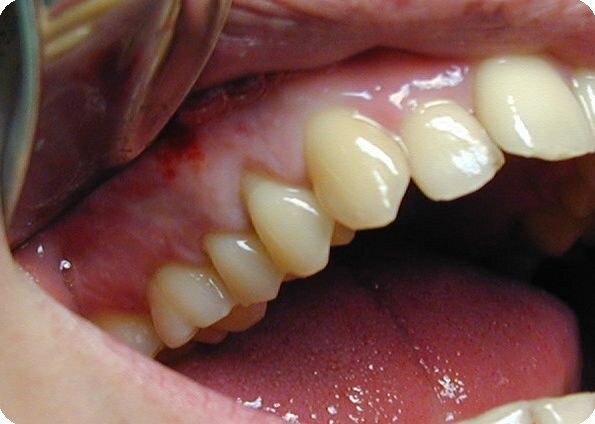 This is most likely a worsening of periodontitis, which is accompanied by transition of edema on the adjacent teeth. To get rid of the tumor, it is necessary to do an x-ray picture to accurately establish the cause of the inflammatory process. With a small swelling physician with therapeutic procedures will eliminate the inflammation. Advanced stage imply that resection of the root basis of the tooth. In young children the cause of tumors of the gums is teething, and in adults the eruption of wisdom teeth. To ease the pain and speed up the growth process, the dentist makes a small incision in the gums. In this case, you must exclude the growth of the tooth at an angle, which is a significant deviation from the norm. Swelling of gums after tooth extraction is a normal reaction to the intervention. To reduce pain, the doctor prescribes drugs that can reduce swelling. For example, effectively rinsing with a solution of salt and soda in equal proportions, diluted hydrogen peroxide, chlorhexidine, a decoction of sage, chamomile. The most common cause of swelling of the gums is the inflammation of the gingival - gingivitis. It is ulcer, catarrhal and hypertrophic. In its course and development is divided into acute and chronic. The most common cause are traumatic factors – injuries of the mucosa, deposits of Tartar, dentures and crowns. The disease is accompanied by pain in the gums, in the chronic form, their loosening, increased salivation, unpleasant breath. Not leading to loosening of the gums, contact a dentist to receive qualified help in removal of Tartar, the qualitative fit of the prosthesis, treatment of the teeth under the crown, generally, the remedy of gingivitis. Use preparations of medicinal plants in the form of anti-inflammatory, antiseptic and analgesic infusions and decoctions for rinsing the mouth. For the treatment of ulcers on the gums and eliminate edema, prepare the following tool. Mix 15 ml of the 10% of the pharmacy alcohol tincture of propolis with 2 tablespoons of olive oil. Wet a piece of sterile bandage the cooked part, put on the gums, pre-rinsing the oral cavity with a solution of peroxide (1 part hydrogen peroxide to 2 parts water). Keep your mouth three times a day for 5-7 minutes on the first day, 8-10 minutes on the second day, to 15 minutes in the following days. The course of treatment – 7-14 days, depending on the condition of the gums. Perfectly disinfects the mucous membrane of the gums, kills bad breath during gingivitis drugs hell. Mix the juice from the roots of horseradish mixed with water, rinse 5-7 times a day the mouth, each time delaying it brew for 2-3 minutes (possible burning). Prepare an infusion of coniferous needles, which is a great vitamin, antimicrobial, deodorizing and anti-inflammatory agent. Destroys bad smell from the mouth. Pour a tablespoon of chopped pine needles to a Cup of boiling water. Insisting in a sealed container in a warm place for one hour, filter. Drink 0.25 Cup 3 times a day after meals and rinse your mouth this infusion three times a day. Timely access to a dentist, visiting his office at least 1 time in six months, as a rule, saves a lot of teeth and financial resources that will be required for dentures. You can also rinse your mouth with the juice of blueberries, strawberries, cabbage juice, a decoction of the roots of calamus, elecampane, chamomile extract, succession, meadow geranium, etc.